If you didn’t have reason enough to attend NRLC 2018 which begins tomorrow, you do now. 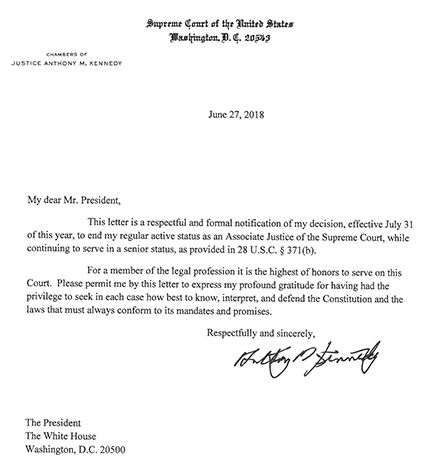 After months of speculation, Anthony Kennedy, the pivotal justice in so many cases including abortion, announced today that he retiring from the Supreme Court effective July 31. The decision by the 81-year-old Kennedy gives President Trump his second opportunity to shape the Supreme Court possibly for decades to come. In April 2017, President Trump formally appointed appeals court judge Neil M. Gorsuch to succeed Justice Antonin Scalia who died in April 2016. Kennedy had dropped a number of hints, only seemingly to step back, that he would be leaving after 30 years on the nation’s highest court. He was appointed by President Reagan in 1988. There have been titanic battles over nominees to the Supreme Court, including those who were ultimately defeated and others, such as Justice Clarence Thomas, who surmounted an all-out attempt at character assassination. But with the Court so evenly divided and with Democrats happily moving further and further to the Left, this confirmation fight will no doubt be one for the ages. Kennedy was a part of the coalition that upheld the core holdings of Roe v. Wade in the 1992 Casey case. He also was part of the majority that struck commonsense abortion regulations in the 2016 Women’s Health v. Hellerstadt decision. On the other side he was a pivotal vote in the 2007 Gonzales v. Carhart decision which upheld the federal ban on partial-birth abortions and just this week was part of the 5-4 majority which struck a California law that attacked the free speech rights of pregnancy help centers.